What will federal policies affecting Alaska Natives look like under the Trump administration? A remarkable era for Alaska Natives and American Indians under President Barack Obama is ending and some tribal advocates are worried that progress will slow or halt under President-elect Donald Trump, who once complained of tribal members in the Lower 48 who "don't look like Indians." Yet Trump is inspiring hope as well as fear. An executive with the state's wealthiest Alaska Native corporation thinks Trump could help open the Arctic to new development, and in turn, new prosperity for Alaska's indigenous people. In interviews since last week's election, a number of Alaska Native leaders said they are withholding judgment. There is little in the public record about Trump's views on Native Americans. There's nothing that shows any knowledge of the special federal laws and programs for Alaska Native people, from the 1971 measure that created the Native corporations and settled land claims to the current oversight over fishing and hunting on federal lands by the Federal Subsistence Board. One new clue may come from the makeup of Trump's Native American Coalition, created in the last days of the campaign to collect support in Indian Country. Not a single Alaskan made the published list of 34 members, even though one in five residents here is Native and 40 percent of the nation's tribes are in Alaska. His transition team, though, includes a Republican well-versed in Alaska Native issues, Troy Eid, an Arab-American and former U.S. attorney for Colorado. He chaired the U.S. Indian Law & Order Commission that in 2013 found public safety and security in rural Alaska were so lacking it amounted to a national disgrace. Obama created unprecedented access to the White House for Native American people, tribal leaders said. He appointed the first presidential Native affairs adviser, held annual tribal gatherings and met with Alaska Native leaders during his visit to Alaska last year. Trump's transition team did not respond to questions about what course he will set. Appointments to key posts such as Interior secretary and attorney general may signal a direction on tribal matters. Trump also can revoke pro-tribe executive orders, including one requiring federal agencies to consult with tribes that dates back to the Clinton administration. Jim Crawford, who chaired Trump's campaign in Alaska, said on Friday the Alaska office had shut down the night before. "We've been asked to refer calls to the vice-president-elect," said Crawford, referring to Mike Pence. "He's in charge of the transition." Alannah Hurley, who showed Obama how to pick salmon from a setnet last year on a Dillingham beach, said she is mourning the loss of Obama and the respect he had for tribes. "He took his trust responsibility — the nation's trust responsibility to its tribes — very seriously, I would say more seriously than any president in the history of the United States," said Hurley, executive director of the United Tribes of Bristol Bay, a 14-tribe consortium. For one, the Obama administration settled $8 billion in claims over mismanagement of Native trusts nationwide, said Native rights lawyer Natalie Landreth. Trump has disparaged people of color and minorities including Muslims, Mexicans — and Native Americans, Hurley said. Another view comes from Tara Sweeney, executive vice-president for external affairs at the Arctic Slope Regional Corp., the North Slope Native corporation that reported $2.5 billion in revenue last year. Though she called Obama a "gracious president" who strengthened tribal relations, Sweeney said she's excited Trump's pro-development agenda will translate into a broad range of economic opportunities, including potentially more oil and gas development in the Arctic Ocean. "I think it's safe to say the Arctic is open for business," Sweeney said. Last month, the Alaska Federation of Natives for the first time in its 50-year history endorsed a presidential candidate in recommending Hillary Clinton. Native voter turnout was not what it should have been in the state, some leaders said. "This election is a call to action for tribal citizens, tribal leaders, and advocates to defend and enhance our inherent sovereignty, our culture, and our people," said Will Micklin of the Central Council of Tlingit and Haida Indian Tribes of Alaska. Clinton out-polled Trump in some of the state's most remote and predominantly Native districts, winning large sections of Western Alaska by a 2-1 margin. But he did better in some parts of Southeast Alaska with high Native populations. Lt. Gov. Byron Mallott, a Tlingit and Democrat, said in an email just days after the election, the Walker administration doesn't yet know how Trump will address Native issues. 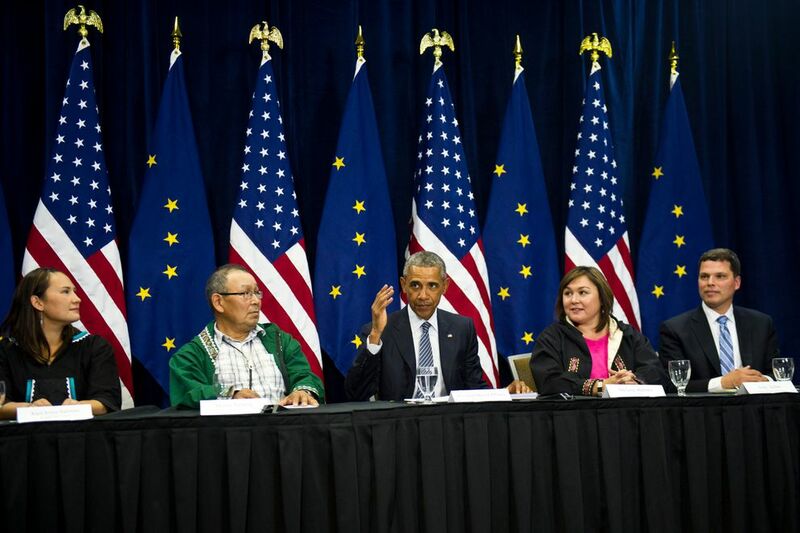 "President Obama's trip to Alaska in 2015 brought international attention to issues important to Alaska's First People," Mallott said. "We look forward to continuing that important dialogue with the Trump Administration." Back in 1993, Trump testified before the Native American subcommittee of the U.S. House Committee on Natural Resources about his concerns with Indian-run casinos. Many were opening in states that hadn't had casinos before. Organized crime was reportedly infiltrating them and nothing was being done, he testified. He said he also was concerned about his potential competitors' tax-free advantage. "I am opposed to gambling when it can't be policed, and I don't believe the Indian reservations can be policed. There's too many of them, and especially when people claim sovereignty when, in fact, there is nothing sovereign," Trump, with three Atlantic City casinos, testified, according to the congressional transcript. "It is only sovereign in that they don't pay taxes." The Native American casinos put profits back into their reservations, Hawaii Rep. Neil Abercrombie told him. Didn't Trump say tribal members should prove they are Indian enough to run casinos? California Rep. George Miller asked. "That probably is me, absolutely," Trump said. "If you look at some of the reservations that you have approved – you, sir, in your great wisdom, have approved — I will tell you right now, they don't look like Indians to me … and they don't look like Indians to Indians, and a lot of people are laughing at it, and you are telling how tough it is, how rough it is, to get approved." Those comments now are being dissected anew. Tribal rights lawyers are on the defensive should Trump take on basics such as tribal membership. "He gets to make no decisions about that," said Natalie Landreth, an Anchorage-based attorney with the Native American Rights Fund. Tribes decide who belongs through "foundational principles in Indian law," said Landreth, a member of the Chickasaw Nation of Oklahoma. "We are ready to go," Landreth said. "Indian identity, who qualifies as Indian, what tribes get to decide as to their membership – all are off limits." The tone of Trump's decades-old comments on Indian casinos may reflect core beliefs, tribal advocates said. On the campaign trail, he called U.S. Sen. Elizabeth Warren "Pocahontas" in tweets criticizing her, then said he regretted it, because it was demeaning to the famed Native American. Warren's claims to distant Cherokee heritage have been controversial. On election night, Trump supporter and former New York City Mayor Rudy Giuliani declared "one of the greatest victories for the people of America since Andrew Jackson." Like Trump, Jackson was anti-establishment. He also traded in slaves and signed legislation for the forced removal of Indian people from their lands. "This is the president who walked people across the nation on the Trail of Tears. This is the type of president his own party is comparing him to," said Hurley, of the Bristol Bay tribal group. The U.S. treasury secretary earlier this year announced Jackson was being replaced on the front of the $20 bill by slavery abolitionist Harriet Tubman. But his image will remain on the back. Generalizations Trump has made about Mexican immigrants – calling them drug dealers and rapists – along with other groups may just be the start, Hurley said. "It's just everything he said about people of color," Hurley said. "We're all in this together. Injustice anywhere is injustice everywhere." The Obama administration's outreach to rural Alaska included trips to far-flung villages by Cabinet officials like Interior Secretary Sally Jewell and Energy Secretary Ernest Moniz. They saw the value of subsistence, providing food on the table in places with few jobs and the fur-and-ivory handicrafts that generate income. In 2013, Jewell visited the Aleut fishing community of King Cove near the tip of the Alaska Peninsula — more than 600 miles from Anchorage — to hear residents request a life-saving gravel road through the Izembek National Wildlife Refuge. The road would reach an all-weather airport in nearby Cold Bay. Jets can land there for medical emergencies so villagers can get critical care at urban hospitals. As it is, only small planes and helicopters land in King Cove, a community of 900, and only if the oft-stormy weather cooperates. Jewell rejected the request, to the outrage of King Cove. The community heavily voted for Trump and sees his administration as a new opportunity, said Mayor Henry Mack, an Aleut who said he supports Trump because he will boost jobs and domestic investment. Mack acknowledged Jewell deserves kudos for the long trip to the village. But she merely paid lip-service, he said. "I don't have any good things to say about the Obama administration. I'm quite frankly very happy he's going," he said. But mainly, Obama's team had strong relationships with tribes. 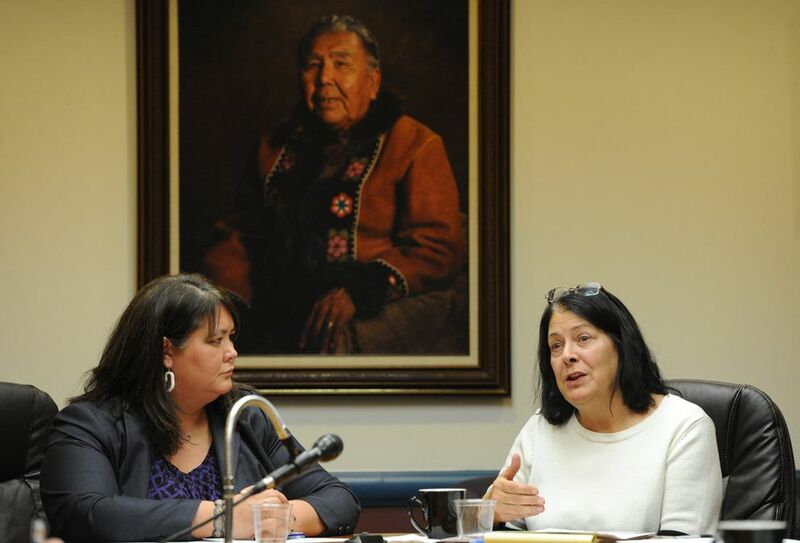 Jewell in October called on AFN to make sure the next administration follows executive orders helping tribes. She is most concerned about losing the Obama executive order that in 2013 established the White House Council on Native American Affairs, which includes Cabinet officers and senior officials. That council is the direct connection for Indian Country to the White House and federal family, Jewell said through an aide this week. Jewell made five trips to Alaska in less than four years as Interior chief. Trump's pick to replace her will be key, said Landreth, the Native rights attorney. The new Interior secretary will rule on petitions from Alaska tribes to take their land into federal trust, protecting it from taxes, creating homelands, and giving them more control. The Trump administration could hobble land-into-trust if it chose, by writing restrictive regulations or not providing funding, including for the high cost of a real estate team to work on petitions, said Mark Trahant, a professor at the University of North Dakota and former Atwood Chair of Journalism at the University of Alaska Anchorage. Also key: the new attorney general, who will set policy in court cases involving Native issues. As for the outgoing president, Trahant, who is Native American, said, "history will look at Barack Obama as one of most extraordinary presidents for American Indians and Alaska Natives." "The reason for that is he treated them with dignity and respect, both in lawsuits, but also in how he advocated for tribal consultation at every turn." One area that could be targeted during a Trump presidency is tribal sovereignty and self-governance – the ability of tribes to run governments, courts, schools and to manage their communities, said Joe Kalt, co-founder of the Harvard Project on American Indian Development. Republicans into the 1990s supported tribal self-governance as a way to address poverty, in the hope it would mean less need for federal support, he said. But new members of the party increasingly view tribal sovereignty as "special rights for a minority," said Kalt, a professor emeritus at Harvard University. Obama's unusual ties to Native Americans insulated tribes, to a degree, he said. "Obama put his neck out pretty strongly in support of tribal self-determination," he said, including appointing the first White House adviser on Native American affairs. Now that protective barrier is gone, he said, and Republicans are in power. "If you're a member of Congress and for whatever reason you want to go after tribal sovereignty, you now face a much easier time doing it, both with fellow colleagues and in the White House," he said. Still, self-determination amounts to local control, "a presumptive value of the Republican Party nationally," said Evon Peter, who is Neetsaii Gwich'in and a University of Alaska Fairbanks vice chancellor for rural, community and Native education. As to tribes themselves, they are enshrined in the U.S. Constitution, he said. He has been advocating for the creation of tribal schools in Alaska. That push will continue, he said. Federal subsistence rights – the priority given to rural residents for fishing and hunting — has been a source of friction in Alaska for decades. It rose to the surface during Obama's first term, when then-Interior Secretary Ken Salazar reviewed what he called a "broken" system. The result was more local input and steps to retain the priority as rural communities grow. Tim Towarak, who stepped down as chairman of the Federal Subsistence Board in September, said he expects Trump's Cabinet to pay less attention to unique Alaska issues such as subsistence. Towarak, who is Inupiaq, timed his departure so Jewell could replace him. "I think the Trump administration will have so many other priorities they will set subsistence aside," said Towarak, a former co-chairman of the Alaska Federation of Natives. "It's an issue only for Alaska and Alaska doesn't typically get as much attention as other states." Trump says he will push for more resource development, fewer regulations and new infrastructure. Sweeney, with ASRC, said as election results Tuesday night pointed toward a Trump victory, the company's strategy quickly began pivoting from defense to offense. The company, representing a region dependent on oil and gas revenues, has less to worry about than with Clinton, who last year indicated her opposition to offshore Arctic drilling. The company envisions a bold agenda that includes not only increased access to natural resources, but other improvements such as getting broadband directly to remote Alaska villages, Sweeney said. While Obama helped lift Alaska Natives through his tribal measures, Sweeney said he left behind Alaska Native corporations created by Congress that play a unique role providing jobs across Alaska and dividends to Native shareholders. "(Obama) could have done more in partnership with Alaska Native corporations in the Arctic with respect to economic development and growth, not just resource development, but any economic growth," she said. DeMarban reported from Anchorage and Demer from Bethel.